Phantom Gourmet’s Andelman brothers – Dan, Dave and Michael – have opened the gates to the Mendon Twin Drive-In for the 2015 season. In April, the Mendon Twin Drive-In will host a trio of special events including a carnival, “Welcome Back Night,” and a screening of the UFC 186 fight. Additionally, the Mendon Twin Drive-In now features new menu items, a pizza shack, an improved sound system and a performance stage in Pop’s Beer Garden. Now through April 19, the Mendon Twin Drive-In has transformed itself into a carnival ground for ultimate family fun. TheBlackstone Valley Carnival is composed of “millions of dollars in steel” with the best rides, games, kid-friendly entertainment and delicious carnival fare. Admission is complimentary. Rides, games and refreshments are available at a la carte pricing. For a full list of hours, please visit: www.mendondrivein.com. On April 24, the Andelmans officially will kick-off the 2015 drive-in season with “Welcome Back Night.” Before the double features on dueling screens begin, there will be a Karaoke Contest for both adults and children and a Corndog Jimmy Jam where they’ll serve up $1 corndogs at Pop’s Beer Garden. The best adult and child performer will score themselves one free corndog a night indefinitely when they visit the Mendon Twin Drive-In. Admission is $25 per car. General admission to the Mendon Twin Drive-In is $25 per car. The Mendon Twin Drive-In is located at 35 Milford Street in Mendon. For more information, please call (508) 473-1092 or visit www.mendondrivein.com. Follow the Mendon Twin Drive-In on Facebook at /MendonTwinDriveIn and Twitter @MendonTwinDriveIn. This weekend, the Mendon Twin Drive-In will screen the much-anticipated Avengers sequel: The Avengers: Age of Ultron. The first 300 cars through the gates Friday night will receive a comic book from Bellingham-based Rubber Chicken Comics. Additionally the first five people to don an Avengers-themed costume on Friday evening will be treated to a complimentary pizza from C’s Pizza Shack, new to the Mendon Twin Drive-In this season. Following The Avengers: Age of Ultron, Cinderella, starring Lily James and Cate Blachett, will be screened in this double-feature evening. The Mendon Twin Drive-In’s other screen will show DreamWorks’ Home, followed by Paul Blart: Mall Cop 2. The Mendon Twin Drive-In was built in 1953 and opened on June 14, 1954. As the area’s premier destination for “first-run” family entertainment at an affordable price, the projection booth is equipped with the latest digital projection & Dolby Digital sound ensuring guests the most pleasant and convenient movie experience. The Mendon Twin Drive-In features a double feature each visit and is open nightly in the summer and weekends during the spring and fall months. The Mendon Twin Drive-In is located at 35 Milford Street in Mendon. For more information, please call (508) 473-1092 or visit www.mendondrivein.com. 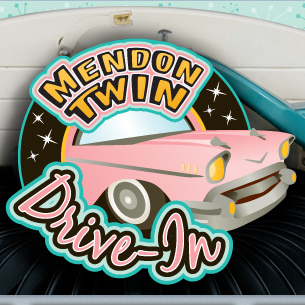 Follow the Mendon Twin Drive-In on Facebook at /MendonTwinDriveIn and Twitter@MendonTwinDriveIn. Phantom Gourmet, Inc. owns and produces the Phantom Gourmet: Food and Fun. Phantom Gourmet is one of Boston’s best known locally grown brands, led by the Andelman brothers, with Dave serving as CEO, Mike heading the business division, and Dan heading the content division. From its humble beginnings on cable in 1993, Phantom Gourmet graduated to broadcast television on myTV38 Saturday and Sunday 10:30am and 11am. Phantom Gourmet is also a feature on the WBZ4 Evening News. The show is on CW28 in Providence Saturday at 10am and WPME-TV and FOX in Maine Sundays. Phantom Gourmet also produces Boston’s biggest and best food events, including the Phantom Gourmet Food Festival, Phantom Gourmet BBQ & Music Festival, Phantom Gourmet Wine & Food Phest, and the Phantom Gourmet Hot Dog Safari to benefit the Joey Fund and Cystic Fibrosis Foundation. For more information, please visit: www.phantomgourmet.com. Follow Phantom Gourmet on Facebook and Twitter. Category: Activities for Kids, Spotlight · Tags: Mendon Twin Drive-In 2015 Season!, Mendon Twin Drive-In Improvements!, Mendon Twin Drive-In Improvments!